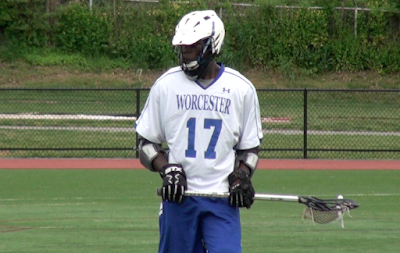 Our Central Mass lax previews continue with a look at the Worcester Combines Lacrosse Team, which draws from each of the public high schools in the city of Worcester. Over the past several years, coach Harry Jones has turned this program into a consistent playoff contender, and made WooLax one of the most buzzed about teams in Central Mass. Our Ryan Morgera lets you know what to expect from this year's squad. After falling 2 games short of the playoffs in 2017, the Worcester Warriors are locked and loaded and more than ready to get rolling this 2018 season. The Worcester Combined Lacrosse program is unlike any other in Central Mass, in that it has many players whose first time picking up the stick and putting on the helmet will be this season. That doesn’t worry coach Harry Jones and the rest of his team, however, as their motto is “No excuses, Just Results." This year, led by senior captains P.J. Sharry and Phil Adarkwah, as well as junior captain Kevin Racine, the Warriors look to build off of last years performance and qualify for the district playoffs. As the season approaches, coach Jones and the Warriors are definitely taking a day-by-day approach, as they believe each day brings a new opportunity to grow and get better. “We are returning to our roots as a gritty, no excuse hard-working team," Sharry said. "I think that alone can have us competing in every game." Offensively, the Warriors are going to be looking to their attack trio to hold a majority of the goal scoring responsibility. Senior captain P.J. Sharry looks to build off of his 2017 performance, as well as linemates Matt Mahan (Junior) and Liam Bowler (Sophomore). After losing Richie Burke, Mike Mahoney, and Andrew Williamson, the Warriors are going to expect a lot out of the attack, however coach Jones believes they are up to the job. “They all can create and find the back of the net” Jones said. “Our trio on attack this year are highly skilled and are playing for each other and not against each other." Defensively, Worcester has a lot of spots to fill, as their entire starting defense from 2017 has graduated. After losing Central Mass All-Star C.J. Gallagher, as well as Jack Whalen, Luke Hanlon, and Jacob Robert, the Warriors are going to look to senior captain Phil Adarkwah to lead the defense this season. Adarkwah is also a tremendous football player for Doherty, and is receiving Division I offers. “We know the talent that moved on, but I think the guys coming up have just as much potential to be great as those before them," Racine said. "We aren’t settling with a 'rebuilding year,' because we all want to win too badly to just roll over and be content with that." After a breakout season at defensive midfield, Adarkwah has made the switch to close defense, a move that Jones believes will work very well for both him and the team. “His aggressiveness and athleticism is unparalleled," Jones said of his senior captain. "He is working hard to be technically sound at the position. He knows he has a massive undertaking, but he thrives with those kind of expectations." To assist Adarkwah on defense will be freshman Nate Bushey, who’s shown great leadership and fundamentals this preseason. The third spot is currently still up for grabs, but with the competition getting higher and higher at practice, Jones has no doubt the position will be filled by someone who works hard and is technically sound at the position. In net for the Warriors is going to be Kevin Racine, a junior captain who made the decision to switch from midfielder to goalie last year. “He has been non-stop in accepting his role and becoming the net minder we need,” Jones added. The Warriors begin their season next Tuesday with a Mid-Mass. league clash at Tantasqua. Look out for the Worcester Warriors this season as they attempt to grow the game of lacrosse in the city of Worcester, as well as build on last year and qualify for districts.